For most of us, our home is the biggest ticket item we'll ever buy. The amount of time, labor, and money this single transaction represents demands a clear head and clear motivations. 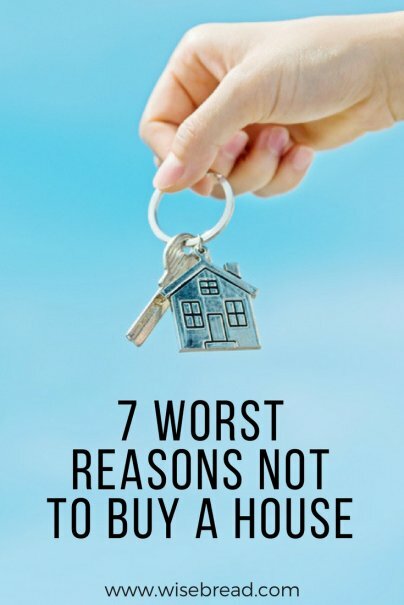 Since we already know there are a lot of terrible reasons to buy a house, let's take a look at things from the other side. Here are the worst reasons not to buy a house. After the Great Recession of 2008, everyone's worried about buying at the top of a bubble. But if you dream of owning a home, you've amassed a healthy down payment, can easily afford the mortgage payment and property taxes, and plan to stay in your new home for a while, stop obsessing about what the market may or may not do. Get on with the business of living in a new home. I admit it; I used to watch lot of house hunting shows on cable TV. And the one conclusion I drew from this voyeuristic exercise? Too many homebuyers are terrified that the things they already own simply won't fit, no matter how generous the proportions of the rooms. I'm not sure it makes sense to reject a home — or homeownership in general — simply because you've amassed a collection of barge-like beds, sofas, and dining room tables. Here's a good rule of thumb: Don't let things that depreciate in value dictate your purchase of something that appreciates in value. If you want to own your home rather than rent, buy a home. Live in it. Sell or rent it when you're ready to move on. You may come out ahead financially, or you may not. But in the meantime, you'll have lived in the home you wanted and that has value in and of itself. Renters may be more carefree than homeowners, but that doesn't always translate into happiness. Renting puts you at the mercy of shifting economies, forces you to deal with a rotating parade of new neighbors (with whom you may share a wall or two), and provides little opportunity to customize or improve your space. Depending on your priorities, renting may be more of a drag than a delight. So, you say you're scared of commitment. Who isn't? But by avoiding homeownership, you're actually committing to something — spending more money on rent, not building equity, sacrificing a certain level of privacy, and potentially retiring with less security. There's proactive commitment and passive commitment. Which do you prefer?